Tofu Paratha is another delicious paratha wherein scrambled tofu seasoned with coriander and few spices, stuffed in the whole wheat dough. After soya kheema paratha, tofu paratha is another paratha with high nutritional values. This paratha can be served in breakfast or snack, kids love these with curd. It is a soy product which is very healthy and gluten-free ingredient. Tofu is a good source of protein and contains all nine essential amino acids. It is also an excellent source of iron and calcium and the minerals manganese, selenium and phosphorous. In addition, tofu is a good source of magnesium, copper, zinc and vitamin B1. Read more here. 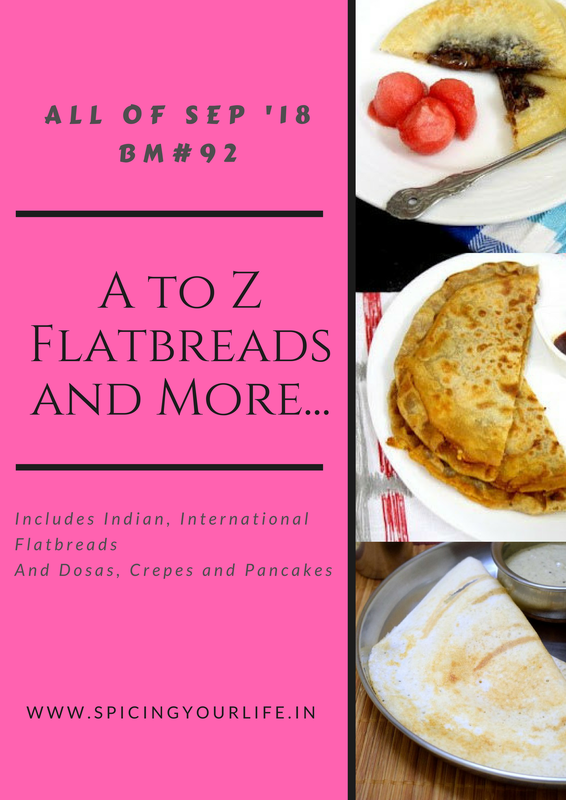 You can more stuff paratha like Gobhi Paratha, Aloo Paratha, Peas Paratha, Mooli Paratha, and paneer paratha. To make tofu paratha first grate it and drain all the water from the tofu, use kitchen paper towels to absorb all the water. After having dry tofu add kitchen king masala, red chili powder, grated ginger, chopped green chili, chopped green coriander. Knead the whole wheat flour dough and stuff the filling. And your tofu paratha is ready to serve with pickle or curd. So let see how to make this delicious, lip-smacking tofu paratha, step by step. First of all, combine all ingredients listed for the dough in a mixing bowl. Knead a soft dough and keep it aside until filling is ready. Cover it with any lid or plate. Now drain all the water from tofu and grate it. Use paper towels to absorb all the water grated tofu have. It should be dry else tofu will come out of the dough while rolling. Add chopped onion, green coriander, chili, and all dry spices. Mix nicely and tofu filling is ready. Divide dough and stuffing into equal parts. With this quantity, I made 8 big parathas. Tofu paratha is ready to serve hot with curd or pickle or any chutney. Make sure tofu is dry and you are draining its water. Rolling out paratha will be difficult if any water content left. It is possible that filling comes out while rolling, no worries just seal it and proceed. Tofu Paratha is another delicious paratha wherein scrambled tofu seasoned with coriander and few spices, stuffed in the whole wheat dough. Tofu paratha is another paratha with high nutritional values. This paratha can be served in breakfast or snack, kids love these with curd. As much as we love paneer, we love tofu as much also. Love this tofu paratha and I am sure my boys would be so happy to eat this. Bookmarking the recipe to make soon. Thanks Sandhya, we enjoy these paratha and tofu is our best pal in breakfast items. The stuffed parathas look so filling and fantastic. Tofu is yet another ingredient we couldn’t get used to. Though this is a fantastic source of protein, it surely is an acquired taste..making it as parathas is a great way to include in the diet. Thanks Srivalli for liking tofu paratha recipe. do try once you will surely love the outcome. Nice healthy paratha. When my daughter was little she used to prefer tofu to panner and I used to make a simple version of tofu paratha for her. Thanks PJ for liking tofu paratha recipe. Tofu paratha looks similar to our paneer paratha. Love your stuffing and the way you have added that in the paratha uniformly. Thanks Renu for appreciating tofu paratha. Adding Indian spices to the tofu to make tofu parathas is a wonderful idea. I wouldn’t mind having tofu in parathas. Thanks, actually these days not liking store bought paneer so make tofu paratha instead of paneer paratha. This paratha looks so tasty and protein packed. What a healthy choice for letter ‘T’ ! Never added kitchen king in parathas, must be tasting great with that. Thanks Ritu, do try and let me know how you find it. I used to make it before but now the kids want grilled tofu all the time so this one has become obsolete at my place but we used to love it before and I am sure with all those spices, it tastes amazing. hahaha I can understand. But I keep making these tofu parathas. Grilled is definitely out of the world. Perfect pick for the alphabet . Thanks di for appreciating tofu paratha recipe. This tofu filling sounds so delicious. Trust me this parathas are one of the best way to sneak this soya protein. We just love tofu parathas very much and i dont forget to make parathas with tofus often as they are one of the best way to add tofu in our diet. Parathas looks simply prefect. yeah Tofu Paratha are cooked more often then paneer paratha. love the taste. Such a flavorful paratha and a delicious way to get kids eating some protein! Awesome!